Established for more than 2,500 years, Marseille holds the second rank amongst the most populated cities of France and is home to the largest Mediterranean port. 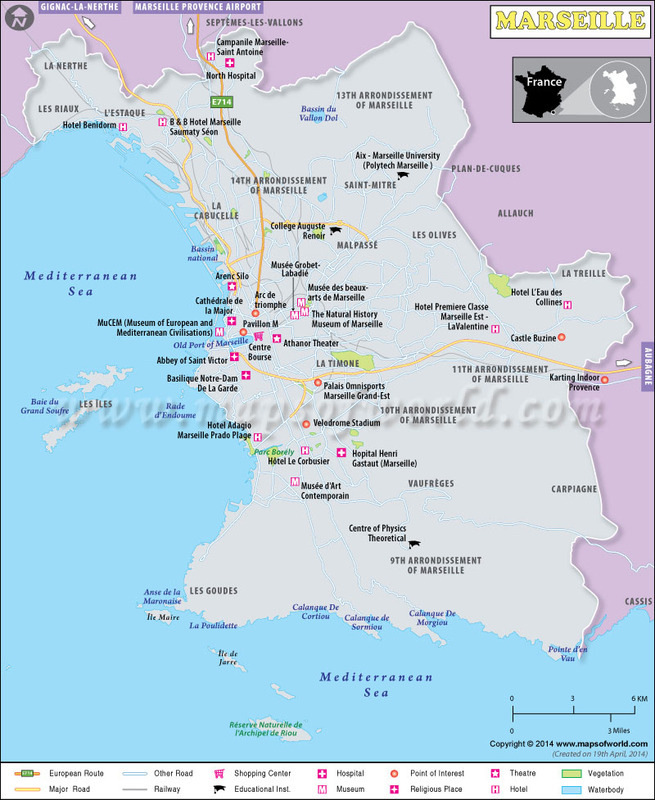 In fact, the city is also noted to be the prominent economic hub of the Provence-Alpes-Cote d'Azur area. The city is said to have a complicated history and people also know it by the name of Port d'Afrique. In 600 BC, the city was discovered by Phoceans and since then has been termed as one of the oldest Europeans cities. Located on the western side of the French Riviera, the city is tagged as one of the prominent ports of the Mediterranean Sea. Situated on the Gulf of Lion, the city lies 536 miles south-southeast of Paris (if one takes a train) and 218 miles southeast of Lyon. The city is spread across an approximate area of 93 square miles. By Air : Located approximately 30 kilometers from the city, is the Marseille-Provence International Airport. One can avail cabs and buses from the airport to reach the desired destination within the city. Besides, one can also get trains for the various destinations within half and hour. And, if one stays in some other European city, then one can also hire shuttle services to reach Marseille. By rail : Marseille St. Charles is the chief railway station that is well connected to the other cities. The railway station lies at a short distance distance from the Old Port and the Canebière. However, it would be unwise to reach the station on foot as it is located on the top of a small hill. The city is connected by rail to Paris, Lyon, Brussels, Geneva, Frankfurt, and Strasbourg. By bus : Bus services like Eurolines have multiple connections across Europe. From the city one can avail direct buses to Tangier, Prague, and Barcelona. The bus terminus is located close to the St. Charles Railway station. By car : The city is well linked to various French cities via multiple highways. By car it takes around 8 hours from Paris, 1.5 hours from Montpellier, 3 hours from Lyon, and 2 hours from Nice to reach Marseille. By boat : The city is home to a huge harbor and has straightway ferry routes from the city to, Porto Torres, Ajaccio, Bastia, Porto Vecchio, and Propriano. Marseille has a pleasant climate across the year; however people prefer planning their tour during the summers. One of the chief reasons to visit the city in the month of July is because France celebrates Bastille Day then. Besides, tourists also plan their tours during the winter, fall, and spring as the climatic conditions are pretty pleasant then. The city is home to over 21 museums that boast of rich archaeology, fine arts as well as superb Marseille traditions. The popular choices on tour, include Vieille Charité, the Porcelain Museum, the Natural History Museum in the Palais Longchamp, and the Fine Arts Museum. Entwined in a remarkable natural environment, between the hills, the sea, and the Calanques, Marseille houses some of the best parks and gardens ever. In fact, approximately 400 hectares of the city has been used for these gardens and parks. The major parks and gardens here are Jardin de la Colline Puget, Parc Valmer, Parc Pastré, Parc Borely, and Parc Longchamp. Finally, one can also choose guided tour packages to explore the Old Port city, its ancient churches like the basilica of Notre-Dame de la Garde, the fishing port of Malmousque, the Euroméditerranée district, and much more. Marseille offers luxury accommodations that include Sofitel Marseille Vieux-Port, C2 hotel, Petit Nice Passedat, Residence du Vieux Port, and Escale Oceania Marseille Vieux Port. On the other hand, if budget is a factor, then options like Residhome Marseille Saint Charles, Appart'City Marseille Euromed, Hipark Marseille, and Hotel Gambetta Marseille work well.